Do you have any questions about this 45 panel Off Grid system, or questions about solar in general? Give us a call at 1-800-472-1142. This off-grid power system features 45 LG MonoX Plus LG-300S1C-A5 Mono Black frame Solar Panels and a Magnum Energy power center. Our expandable off-grid power systems include the essential components to get started living off the grid, allowing you to enjoy all the comforts of home with normal AC appliances no matter where your property is located. 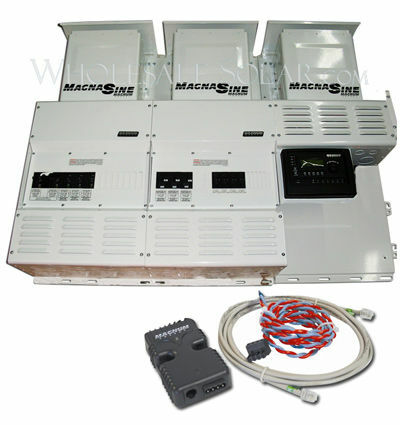 The Magnum Energy inverters convert the DC, or Direct Current, electricity produced by your solar panels into a clean form of AC, or Alternating Current electricity compatible with sensitive electronics. You won't get background fuzz on your stereo or weird lines on the TV screen that you might get when you use modified sinewave inverters. 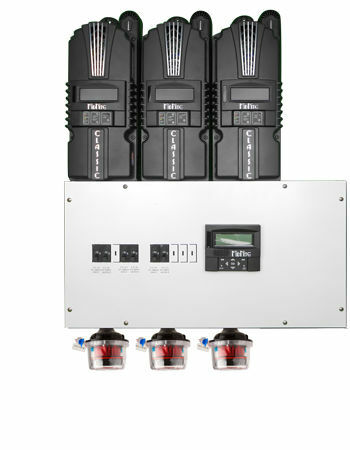 This off grid solar system will deliver full power to a 240 or 120-volt load and includes a battery charger for use with a backup generator. Use our Off-grid Sizing Worksheet (PDF) to estimate your future power use, and call Wholesale Solar to customize any off-grid project.